With 3 of us getting a rather last minute entry into this event, there wasn’t much time to really think about it. With this, Michelle and John set to work the day before the event and bagged van hire, with John being very kind in offering to drive and be our DS/Sogniour for the weekend. The Journey started 6.30 from south London, picking up Bella and then Mhairi before heading to the Hog, where the first two stages were being held. There were approx 66 starters. Our aim/motto for the weekend: Have fun, stay safe, and look out for each other in the bunch…..
With none of us being TTer’s, we just decided to give it what we could without blowing up straight away. Job done. Very respectable times; Mhairi 6.23, Bella 6.29 and Michelle 6.31. Please with our times and done by 11.15, we set to work….resting hard for just under 4 hours before our 3pm start of stage 2. 50km crit of the hog. We were gridded in time order, from TT at the bottom of the circuit. It was always going to be hard for anything to split, with us thinking back to the team series, where it pretty much kept all together for the duration. This race was not that different, apart from Sarah Storey attacking and going solo for most of the race, no other attacks really stuck. We all had some time on the front, some might say I had too much time! Having digs and attacking myself a few times. Despite getting a gap, it was apparent that I was just not strong enough on my own and I was quickly reeled back in. It was fun to have a go though. Got to try these things. There were a few accidents on the hill, predictably. Mhairi locking handlebars with another rider, me going off road (no change there) and Michelle doing well to avoid an accident in front of her on the hill. Think rain, real heavy rain, and flooded, gritty roads. The sort of weather where you can’t really see in front of you. 58 starters today. We rolled out into the 10k neutralised section. That was, surprisingly neutralised. 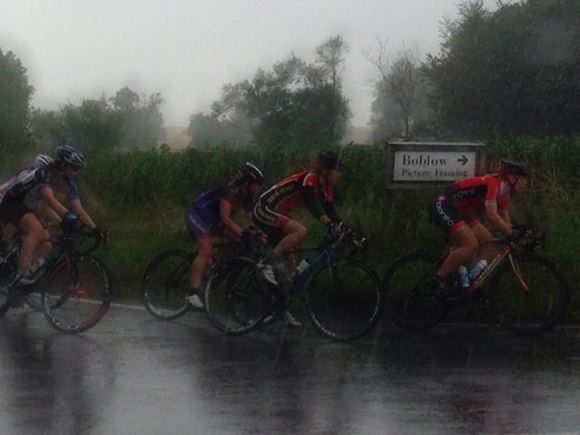 We then had to wait in the pouring rain for about half an hour whilst the mens raced past. Late starts and an accident in the race had caused the delay. However, once we were off, we were off. I was concentrating so hard to stay upright, stay safe, but not bottle it and ride hard. I was actually kind of enjoying the wet, grit and dirt. Thinking about a ride I’d done where it was mostly off road, on gravel and tracks. I zoned into this. There was a accident, punctures and some dropping out due to the distance and conditions. We’d all found each other at points, checking we were ok and encouraging one another. I really liked this…. ‘Just look out for the red jersey’. The next lap went by, and not seeing Michelle, I was told by another rider that she had punctured. The sun made an appearance after a couple of laps or so. Myself and Mhairi drifted around the bunch, being able to chat to one another. Both wondering about the inevitable bunch sprint. Mhairi saying that if we weren’t the right side of the bunch at the junction before the turn into finish, we’d get swamped again. Myself and Mhairi saw the front of our lead group a few times. I allowed myself to drift back, right back. Something I am usually hesitant to do for fear of being dropped if something kicks off. However, as I drifted back, I found out a few things 1) the lead group was now only about 30 strong 2) there was a lot of freewheeling the further back you go and 3) right at the very back, were some strong riders, who I thought would definitely be contesting the sprint…..Two went off and weren’t caught. Coming into the last bit, I found myself ‘the wrong side’ of the bunch before the junction, at least 20 or so riders back. As we turned and entered the final drag to the finish I could see Mhairi up ahead and a gap….A GAP! For the first time, I didn’t hesitate and just went for it, went for the gap. I over took quite a few riders and then my gap starting closing as someone swerved, making those in front do the same. I had to apply a little pressure to my brakes and swerve myself, but managed to finish just behind Mhairi. 11th and 12th!! John and Michelle kindly took care of us. Our brains had been left at the finish somewhere and stringing a comprehensive sentence together was near impossible. The journey home was fun, Talking about the weekend and our adventure. Living like a pro, being looked after by John. It was all amazing. Massive thanks to John. Having a van and someone to drive and assist with everything; from our bikes to attending ‘managers’ race briefings, just took out a huge level of stress and we could concentrate on racing. I think john would like a team car next time….